A Blog well worth a visit, Catholic Lane (CL), brought me to this article on the topic of the Catechism of the Catholic Church. It use to be that the argument "We don't need your Catechism" was mainly a Catholic Protestant debate, however more and more this argument is being heard among Catholics themselves. 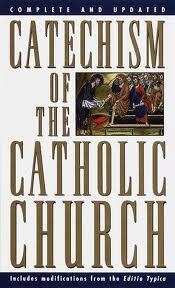 Imagine that, there is no longer an understanding that there is a need for the Catechism within the our Church menbers who's benefit it was written for. This may be because for many reasons, ignorance of what it contains, how to use it, maybe understanding it and refusing to apply it in our own lives because it means changing how we live. CL's article brings this in light of the author teaching to catechism teachers in his parish. He made me aware of a few techniques on how to properly instruct, namely presentation and questions to reinforce what's been taught. Many times, maybe because of time constraints one concentrates on just getting out the information and not much on if the audience understands the material.